Background: Most economic evaluation models compare a new patented drug (NPRx) to a generic comparator. 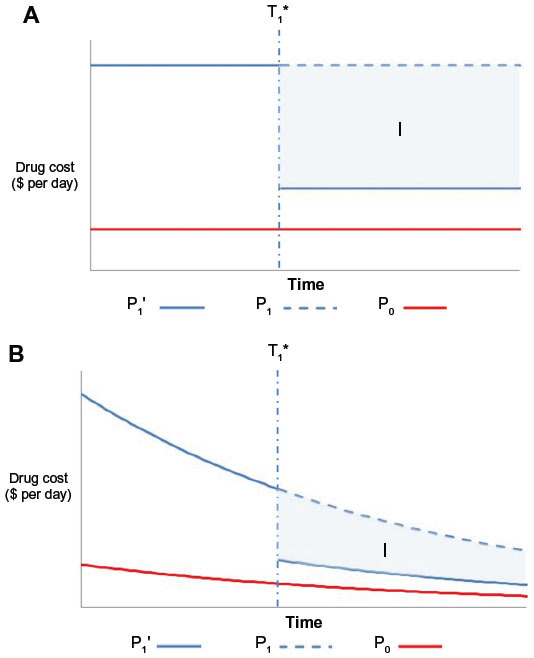 Drug costs within these models are usually limited to the retail cost of both drugs at the time of model conception. However, the retail cost of the NPRx is expected to drop once generic versions of this molecule are introduced following the expiration of the NPRx’s patent. The objective of this study was to examine the impact on the incremental cost-effectiveness ratio (ICER) of the future introduction of lower-cost generic versions of the NPRx within the model’s time horizon. Methods: We examined the impact of this parameter with the use of two approaches: 1) a mathematical proof identifying its impact on the NPRx’s ICER; and 2) applying this parameter to a previously published economic model comparing a NPRx to a generic comparator and identifying what would have been the NPRx’s ICER had this model considered this parameter. Results: As expected, both the mathematical proof and the application to the previously published economic model showed that considering the future introduction of lower-cost generic versions of the NPRx within the model’s time horizon lowers the NPRx’s ICER. The timing of the future entry of lower-cost generic molecules, their relative price compared to that of the patented version, and the discount rate applied to future costs all influenced the results. Conclusion: An ICER estimated within economic evaluations comparing NPRx to generic comparators which ignore the future introduction of lower-cost generic versions of the NPRx within the model’s time horizon will tend to be overestimated. Inclusion of this parameter should be considered within future economic evaluations. Many drug funding agencies require that drug reimbursement submissions contain an economic evaluation. They normally compare the incremental cost-effectiveness ratio (ICER) of a new drug that is still under patent to a comparator drug, which may either be a generic or a patented drug at the time of the drug reimbursement submission (for the purpose of this paper, we assumed the existence of a single comparator despite the fact that multiple comparators may exist). Although each economic evaluation is unique, both the new drug and the comparator drug costs are always included. 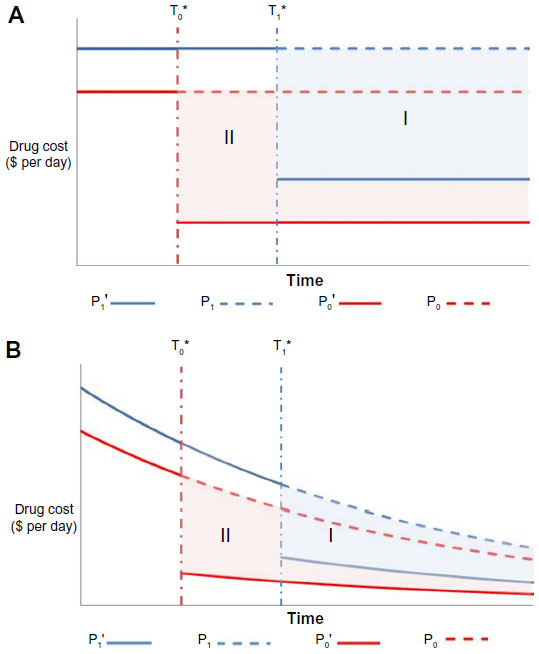 These costing parameters are generally modeled as fixed-in-time parameters which are based on the cost of each drug at the time of model conception.1 However, such an assumption does not truly reflect reality, as the cost of a patented drug drops once generic versions of the molecule are introduced. As previously shown by Shih et al,2 economic evaluations that ignore this point will tend to overestimate the lifetime cost of a drug which is still under patent at the time of the economic evaluation. In order to more accurately reflect actual practice, Canadian and international guidelines recommend that the future introduction of lower-cost generic versions of patented molecules, if they are expected to appear within the examined time horizon, be considered within economic evaluations.3,4 Although international guidelines remain vague on the impact of omitting this possibility,3 Canadian guidelines clearly state that without considering the future introduction of lower-cost generic versions of the comparator drug, the estimated ICER will be underestimated.4 Such wording seems to ignore the fact that generic versions of a new patented drug may also be introduced within the examined time horizon, as many economic evaluations are conducted under a lifetime horizon which frequently exceeds its relevant patent period (ie, from the moment when a new drug is reimbursed until the end of its patent life) as well. The objective of this paper is to examine the impact of failing to account for the future introduction of lower-cost generic versions of a new patented drug in hopes that it would be included by health economists within future economic evaluations to more accurately reflect the lifetime cost of both treatments. First, we highlight how failing to account for the future introduction of lower-cost generic versions of a new drug may overestimate its total lifetime cost by means of a mathematical proof and further examine which parameters will influence its impact. Next, we present the impact of failing to account for the future introduction of lower-cost generic versions of a new drug on the results of a previously published Canadian economic evaluation.5 Lastly, we conclude this paper by highlighting several limits associated with modeling the future introduction of lower-cost generic versions of both drugs within economic evaluations. We first revisit the mathematical framework originally presented by Shih et al2 from which we examine the impact of considering the future introduction of lower-cost generic versions of a new patented drug when the generic versions of the comparator drug are available. Let T = end of the model’s time horizon; C1(t) = mean total cost associated with the new drug at time t; C0(t) = mean total cost associated with the comparator drug at time t; ND1(t) = mean nondrug costs of the new drug at time t; ND0(t) = mean nondrug costs of the comparator drug at time t; P1(t) = price of the new drug at time t; P0(t) = price of the comparator drug at time t; Q1(t) = mean total quantity of the new drug consumed at time t; Q0(t) = mean total quantity of the comparator drug consumed at time t; E1(t) = mean effectiveness of the new drug at time t; E0(t) = mean effectiveness of the comparator drug at time t; r = discount rate; j=1 if new drug or 0 if the comparator drug; ΔC = incremental cost when ignoring the future introduction of lower-cost generic versions; ΔC′ = incremental cost when considering the future introduction of lower-cost generic versions; ΔE = incremental effectiveness when ignoring the future introduction of lower-cost generic versions; ΔE′ = incremental effectiveness when considering the future introduction of lower-cost generic versions; ICER = ICER when ignoring the future introduction of lower-cost generic versions; and ICER′ = ICER when considering the future introduction of lower-cost generic versions. Figure 1 Undiscounted (A) and discounted (B) price of the two drug comparators over the model’s time horizon when the comparator drug is already a generic drug. Notes: I: overestimation of the lifetime cost of the new drug; P0: daily price of the generic comparator drug; P1′: daily price of the new drug when considering the future introduction of generic versions of the molecule; P1: daily price of the new drug when ignoring the future introduction of generic versions of the molecule; T1*: timing of the introduction of generic versions of the new drug. then ΔC′ > ΔC and ICER′ > ICER. As in the previous setting, the difference between ΔC’ and ΔC will depend on the timing of the introduction of generic versions of each drug (T0* and T1*), the differential price between the patented version and generic version of each drug, and the discount rate applied to future costs (Figure 2). Figure 2 Undiscounted (A) and discounted (B) price of the two drug comparators over the model’s time horizon when both drugs are patented molecules. Notes: I: overestimation of the lifetime cost of the new drug; II: overestimation of the lifetime cost of the comparator drug; P0’: daily price of the comparator drug when considering the future introduction of generic versions of the molecule; P0: daily price of the comparator drug when ignoring the future introduction of generic versions of the molecule; P1’: daily price of the new drug when considering the future introduction of generic versions of the molecule; P1: daily price of the new drug when ignoring the future introduction of generic versions of the molecule; T0*: timing of the introduction of generic versions of the comparator drug; T1*: timing of the introduction of generic versions of the new drug. As presented in the original paper by Shih et al,2 this mathematical framework demonstrates that failing to account for the future introduction of lower-cost generic versions of both drugs will lead to biased estimates of the ICER. However, unlike their conclusions, we highlight that failing to account for the future introduction of lower-cost generic versions in economic evaluations comparing a new patented drug to a generic comparator drug will likely overestimate the ICER of a new drug. Of course, the distinction we note is only relevant in the context where generic versions of the new drug are expected to be introduced within the economic model’s relevant time horizon (ie, if T1* < T). In 2011, Sorensen et al5 published an economic evaluation comparing the use of dabigatran etexilate to warfarin in the prevention of stroke and systemic embolism in atrial fibrillation in the Canadian setting. Although dabigatran etexilate was shown to be cost-effective compared to the use of “trial-like” generic warfarin (ICER = CAN$10,440/quality-adjusted life year), Sorensen et al fixed the daily drug cost of dabigatran etexilate at CAN$3.20, thereby ignoring the future introduction of a lower-cost generic version of dabigatran etexilate.5 Using this study setting, we created a simplified model in which we examined the impact of the future introduction of lower-cost generic versions of dabigatran etexilate within the examined time horizon. We created a Markov model which followed a simulated cohort of patients from the time of atrial fibrillation diagnosis up to time of death or up to a maximum age of 100 years using monthly cycle lengths. For this simplified model we assumed that patients’ persistence to both drugs was perfect and only considered all-cause mortality; patients would thus incur costs from model initiation up to their time of death. 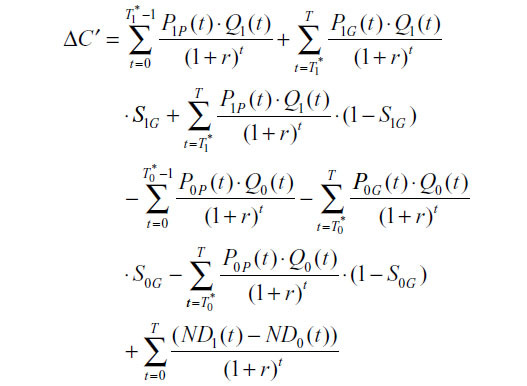 Our simplified model uses only the simulated drug-related costs, ignoring both the non-drug-related cost and the effectiveness components of the ICER, because the future introduction of generic dabigatran etexilate would only affect the drug-related costing component of the ICER (see Equations 7 and 8). Although the incremental effectiveness was not modeled, we assumed that the dabigatran etexilate arm provided added benefits compared to the warfarin arm. All model inputs are detailed in Table S1. It is currently unknown when generic versions of dabigatran etexilate will be introduced nor what will be their retail cost. In our base case analysis, we assumed that generic versions of dabigatran etexilate would be introduced 7 years after model initiation and that all surviving patients would switch to generic dabigatran etexilate once it becomes available. This assumption was based on the time difference between the publication of Sorensen et al’s paper and the expected date of dabigatran etexilate’s first patent expiration (ie, February 18, 2018).5,6 Such an assumption reflects data protection laws currently in place in Canada which guarantee 8 years of market exclusivity from the time the drug receives its Notice of Compliance from Health Canada. (Dabigatran etexilate’s first Notice of Compliance was issued on June 10, 2008. 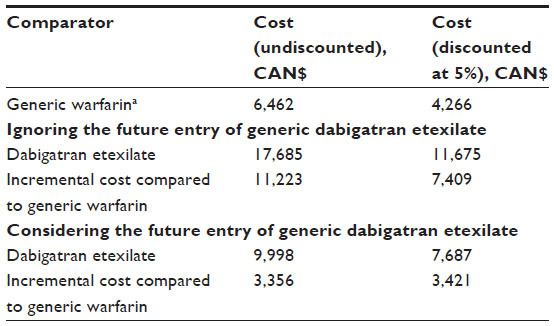 )7,8 In regards to the cost of generic dabigatran etexilate, we assumed that generic versions of dabigatran etexilate would be priced at 25% of the cost of the patented version based on current practice in Ontario, Canada.9,10 Under such settings, our results show that the undiscounted incremental cost of dabigatran etexilate compared to warfarin, when ignoring the future introduction of generic versions of dabigatran etexilate, would be overestimated by CAN$7,867 (70.1%) (CAN$3,988 [53.8%] when discounting future costs at a 5% discount rate) (Table 1). Note: aCosts include international normalized ratio monitoring costs. In order to take the uncertainty around these estimates into consideration, we conducted two-way sensitivity analyses for both inputs. 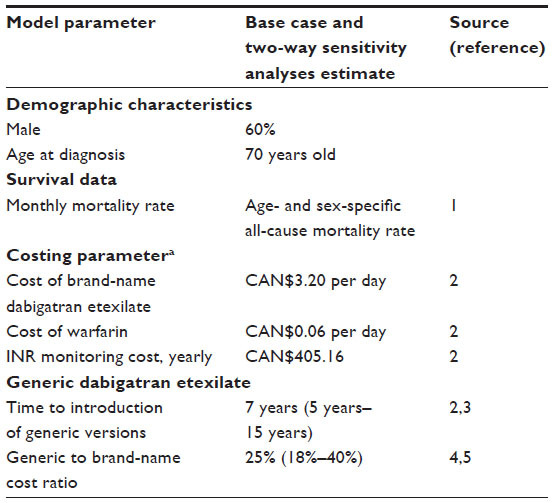 The time to the introduction of generic dabigatran etexilate was arbitrarily varied from 5 to 15 years and the generic to patented drug price ratio was varied from a low of 18% to a high of 40% in order to reflect current price ceilings observed in Canada.9–12 As expected, the overestimation of the incremental cost was greater when generic versions were introduced earlier on and when the generic to patented drug cost ratio was lower (Table 2). Notes: Table 2 only shows overestimations with future costs discounted at a 5% discount rate; an undiscounted overestimation would be greater. Values are shown as absolute and relative to the ICER estimated when ignoring the future introduction of generic dabigatran etexilate. Abbreviation: ICER, incremental cost-effectiveness ratio. Shih et al had originally claimed that ignoring the future introduction of generic versions of a drug when both the new and comparator drugs are patented drugs would tend to underestimate the ICER.2 However, we have shown that ignoring this parameter will only result in an underestimation of the ICER under specific conditions (ie, Equation 10). In the context where the comparator drug is already a generic drug and lower-cost generic versions of the new drug are expected to be introduced within the examined time horizon, we have shown that ignoring this possibility will tend to overestimate the new drug’s ICER. Although we believe that health economists should include this possibility at least as a sensitivity analysis within future economic evaluations, many factors may limit its inclusion. First, as highlighted by other authors,1,2,4 the actual time of introduction of generic versions of a patented drug and the subsequent price of these generic versions may be unknown at the time of model conception. In our base case model, we assumed that generic versions of dabigatran etexilate would be introduced 7 years after model initiation and at 25% of the patented drug cost, but this may not be the case. There are situations where generic versions are introduced before patent expiration, and in other cases they are introduced years later.1,2 As we have shown, the impact of ignoring the future entry of lower-cost generic versions of a molecule on the ICER is highly dependent on both inputs (Table 2). Second, we assume that all patients would switch to the lower-cost generic version of a drug once it is introduced. This assumption may not truly reflect reality. There are cases where a proportion of patients decide to remain on the higher priced patented drug even though a lower-cost generic version exists.13,14 Despite this fact, several jurisdictions only cover the cost of the lower-cost generic version and all other costs would be assumed by the patient.15–19 In such cases, if the economic evaluation is conducted under the societal perspective, Equation 8 would have to be modified in order to take into account the proportion of patients remaining on the higher priced patented drug and those switching to the lower-cost generic versions (Equation S1). However, if the economic evaluation is conducted under a third-party payer perspective, which imposes reference-based pricing schemes, no such modification would be needed. Third, the proposed equations ignore the potential for additional comparators to be introduced within the examined time horizon. Although future comparators could affect medical practice following their introduction, most economic evaluations ignore this possibility. This is simply because economic evaluations are limited by the current state of knowledge at the time of their conception. Finally, these proposed equations all assumed that generic versions of both drugs are as effective as their reference patented versions. Although some have critiqued their equivalency,20 it is normally assumed that generic versions of a small molecule are as effective as their reference patented version.16,20,21 Similarly, although some have highlighted the fact that subsequent entry biologics’ effectiveness may differ from that of their reference biologics, they are also generally considered to be as effective.22–24 However, in cases where this assumption would not hold,25,26 a traditional economic model (ie, one which ignores the future introduction of lower-cost generics) should be favored. 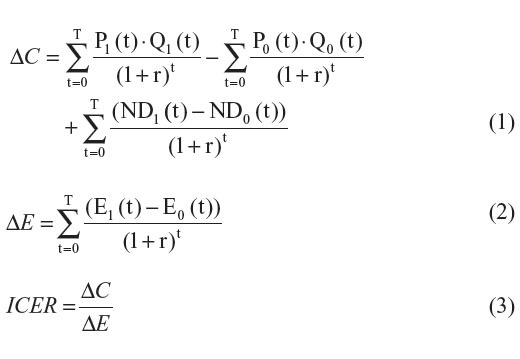 As such, health economists who wish to use these equations within future economic models should justify that this assumption is appropriate. It is obvious that if the price of a drug decreases during the examined time horizon, it should be included within the economic model. However, considering the limits associated within its inclusion, health economists may wish to incorporate it as an additional sensitivity analysis to provide decision makers with a more complete representation of the economic impact of funding the new drug. Therefore, we suggest that, unlike current recommendations,4 the potential future introduction of lower-cost generic versions of the new and comparator drugs, and not only for the comparator drug, be considered within future drug reimbursement submissions. As highlighted by Shih et al and mentioned within current Canadian guidelines,2,4 when both drugs are patented drugs, ICER will likely be underestimated if economic evaluations omit the potential future introduction of lower-cost generic versions. However, within economic evaluations comparing a new patented drug to a generic comparator drug which omit the potential future introduction of lower-cost generic versions of the new drug, the ICER will likely be overestimated. No financial support was provided for this study. However, at the time of writing this article, Jason R Guertin was a Pfizer Canada Post-Doctoral Mentoree and Farzad Ali was a Pfizer Canada Inc. employee. Jacques LeLorier and Dominic Mitchell have both received consulting honoraria from Pfizer Canada Inc. The authors report no other conflicts of interest in this work. Hoyle M. Future drug prices and cost-effectiveness analyses. Pharmacoeconomics. 2008;26(7):589–602. Shih YC, Han S, Cantor SB. 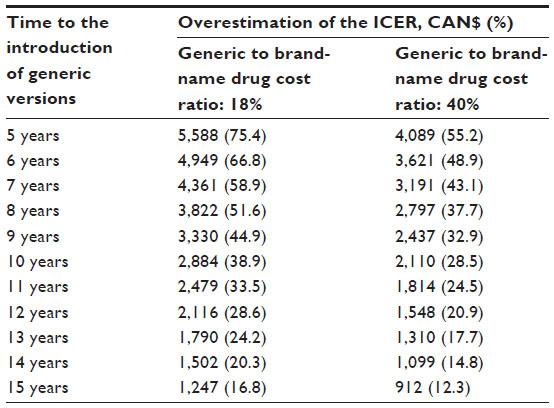 Impact of generic drug entry on cost-effectiveness analysis. Med Decis Making. 2005;25(1):71–80. Hay JW, Smeeding J, Carroll NV, et al. Good research practices for measuring drug costs in cost effectiveness analyses: issues and recommendations: the ISPOR Drug Cost Task Force report – Part I. Value Health. 2010;13(1):3–7. Guidelines for the Economic Evaluation of Health Technologies: Canada. [3rd Edition]. Ottawa: Canadian Agency for Drugs and Technologies in Health; 2006. Sorensen SV, Kansal AR, Connolly S, et al. Cost-effectiveness of dabigatran etexilate for the prevention of stroke and systemic embolism in atrial fibrillation: a Canadian payer perspective. Thromb Haemost. 2011;105(5):908–919. Orange Book: Approved Drug Products with Therapeutic Equivalence Evaluations [webpage on the Internet]. Silver Spring: US Food and Drug Administration. Available from: http://www.accessdata.fda.gov/scripts/cder/ob/docs/patexclnew.cfm?Appl_No=022512&Product_No=001&table1=OB_Rx. Accessed October 2, 2014. Register of Innovative Drugs [webpage on the Internet]. Ottawa: Health Canada; [updated August 12, 2015]. Available from: http://www.hc-sc.gc.ca/dhp-mps/prodpharma/applic-demande/regist/reg_innov_dr-eng.php. Accessed July 8, 2015. Guidance Document: Data Protection under C.08.004.1 of the Food and Drug Regulations [webpage on the Internet]. Ottawa: Health Canada; 2011. Available from: http://www.hc-sc.gc.ca/dhp-mps/prodpharma/applic-demande/guide-ld/data_donnees_protection-eng.php. Accessed July 8, 2015. Moulton D. Provincial squeeze on generic prices continues. CMAJ. 2011;183(14):E1049–E1050. Beall RF, Nickerson JW, Attaran A. Pan-Canadian overpricing of medicines: a 6-country study of cost control for generic medicines. Open Med. 2014;8(4):e130–e135. The Council of the Federation. Provinces and Territories Seek Significant Cost Savings for Canadians on Generic Drugs 2013. Available from: http://www.councilofthefederation.ca/phocadownload/newsroom-2013/nr-cof-generic_drugs_final-jan_18.pdf. Accessed May 10, 2014. Law MR. Money left on the table: generic drug prices in Canada. Healthc Policy. 2013;8(3):17–25. Kong Y. Competition between brand-name and generics – analysis on pricing of brand-name pharmaceutical. Health Econ. 2009;18(5):591–606. Balaban DY, Dhalla IA, Law MR, Bell CM. Private expenditures on brand name prescription drugs after generic entry. Appl Health Econ Health Policy. 2013;11(5):523–529. Lexchin J. The effect of generic competition on the price of brand-name drugs. Health Policy. 2004;68(1):47–54. Bell C, Griller D, Lawson J, Lovren D. Generic Drug Pricing and Access in Canada: What are the Implications? Toronto: Health Council of Canada; 2010. Available from: http://www.healthcouncilcanada.ca/rpt_det.php?id=156. Accessed May 10, 2014. Acosta A, Ciapponi A, Aaserud M, et al. Pharmaceutical policies: effects of reference pricing, other pricing, and purchasing policies. Cochrane Database Syst Rev. 2014;10:CD005979. Narine L, Senathirajah M, Smith T. Evaluating reference-based pricing: initial findings and prospects. CMAJ. 1999;161(3):286–288. Dylst P, Vulto A, Simoens S. The impact of reference-pricing systems in Europe: a literature review and case studies. Expert Rev Pharmacoecon Outcomes Res. 2011;11(6):729–737. Baumgärtel C. Myths, questions, facts about generic drugs in the EU. GaBI J. 2012;1(1):34–38. Duerden MG, Hughes DA. Generic and therapeutic substitutions in the UK: are they a good thing? Br J Clin Pharmacol. 2010;70(3):335–341. Stewart A, Aubrey P, Belsey J. Addressing the health technology assessment of biosimilar pharmaceuticals. Curr Med Res Opin. 2010;26(9):2119–2126. Kesselheim AS, Stedman MR, Bubrick EJ, et al. Seizure outcomes following the use of generic versus brand-name antiepileptic drugs: a systematic review and meta-analysis. Drugs. 2010;70(5):605–621. Mintzer S. Brand spanking? The presumptive risks of generic antiepileptic drugs. Epilepsy Curr. 2011;11(2):54–55. Equation S1 Incremental cost of the new drug under the societal perspective. Notes: ND1(t) represents the mean nondrug costs of the new drug at time t; ND0(t) represents the mean nondrug costs of the comparator drug at time t; P1P(t) represents the price of the patented new drug at time t; P1G(t) represents the price of the generic new drug at time t; P0P(t) represents the price of the patented comparator drug at time t; P0G(t) represents the price of the generic comparator drug at time t; Q1(t) represents the mean total quantity of the new drug consumed at time t; Q0(t) represents the mean total quantity of the comparator drug consumed at time t; S1G represents the proportion of individuals switching from the patented version to the generic version of the new drug once the generic version of the new drug is introduced; S0G represents the proportion of individuals switching from the patented version to the generic version of the comparator drug once the generic version of the comparator drug is introduced; and T represents the end of the model’s time horizon. Note: aAll costs are in 2010 Canadian values. Abbreviation: INR, international normalized ratio. Life Tables, Canada, Provinces and Territories 2009 to 2011 [webpage on the Internet]. Statistics Canada; [updated September 25, 2013]. Available from: http://www.statcan.gc.ca/pub/84-537-x/84-537-x2013005-eng.htm. Accessed October 2, 2014.